Arcanum junior Audrey Heiser goes for a smash shot against Miami East on Wednesday night in the Division III sectional finals at Brookville. The Vikings won in three sets to advance to the district tournament. Arcanum junior Camille Pohl goes for a smash shot against Miami East on Wednesday night in the Division III sectional finals at Brookville. The Vikings won in three sets to advance to the district tournament. Arcanum’s Gracie Garno serves the ball against Miami East on Wednesday night in the Division III sectional finals at Brookville. The Vikings won in three sets to advance to the district tournament. 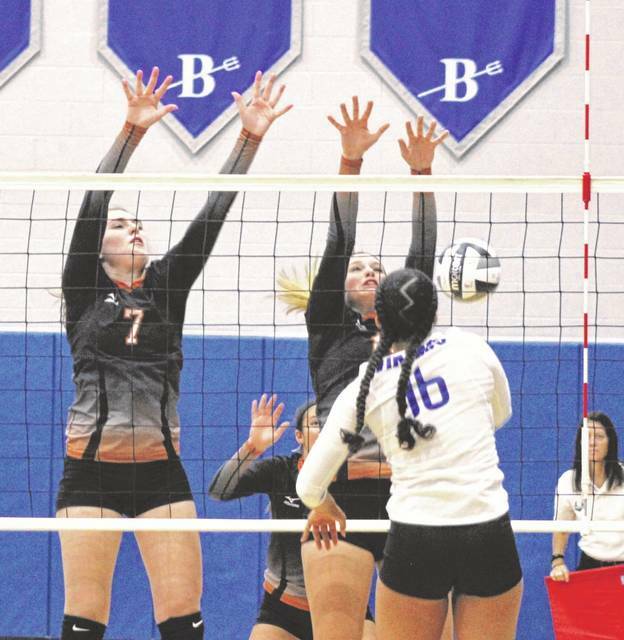 Arcanum’s Jenna Haney (7) and Taylor Gray go up for a block attempt against Miami East on Wednesday night in the Division III sectional finals at Brookville. The Vikings won in three sets to advance to the district tournament. Arcanum’s Jenna Haney goes up for a solo block against Miami East on Wednesday night in the Division III sectional finals at Brookville. The Vikings won in three sets to advance to the district tournament. Arcanum senior Macey Hartman serves the ball against Miami East on Wednesday night in the Division III sectional finals at Brookville. The Vikings won in three sets to advance to the district tournament. 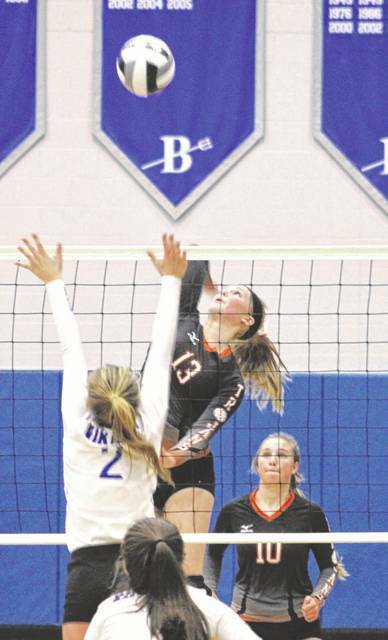 Arcanum freshman Taylor Gray goes for a smash shot against Miami East on Wednesday night in the Division III sectional finals at Brookville. The Vikings won in three sets to advance to the district tournament. 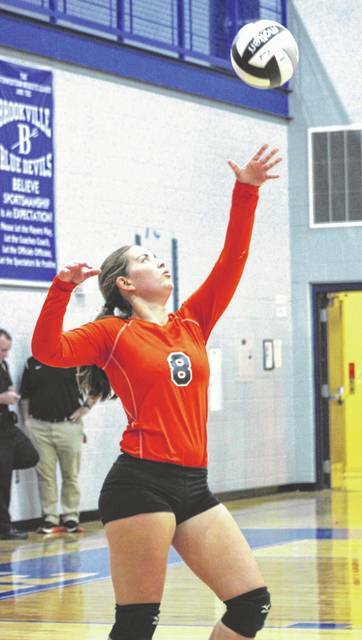 BROOKVILLE – There are many reasons for the Arcanum girls volleyball team to be pleased with its season. 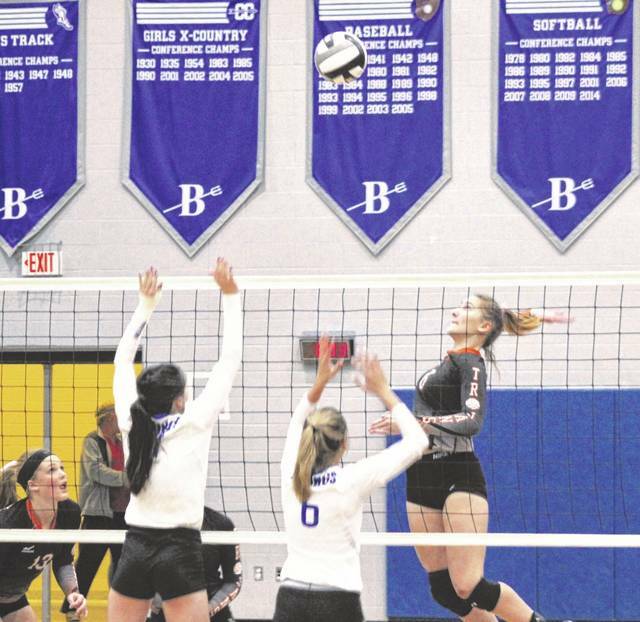 In the near future, the coaches and players will look fondly back on those successes, but right now all they can think about is a devastating loss to Miami East on Wednesday night in the Division III sectional finals at Brookville. 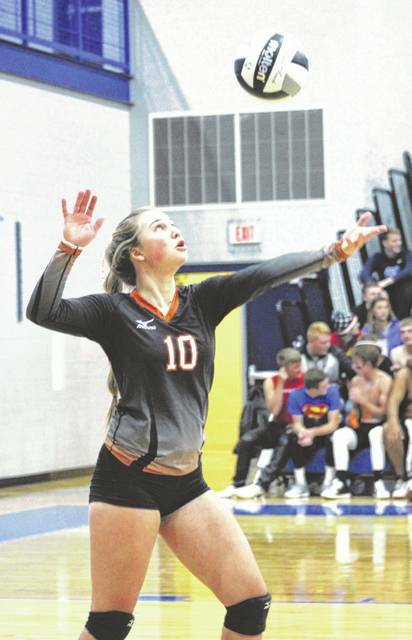 The Trojans were playing for a chance to be in the district finals for the first time in many years, but the Vikings also had visions of reaching that point and they made it happen with a three-game sweep of Arcanum, 25-19, 26-24, 25-19. The Trojans, who finished a close second to Miami East in the Cross County Conference this season, didn’t go down without a fight, however. In the first set they stayed right with Miami East never falling behind by more than four points until the Vikings got the score to 20-15. Miami East then got up 24-17 before a Taylor Gray kill made it 24-18 and then 24-19 before Miami East took match point. The second set was even more tightly contested. Miami East got out to an early 5-1 lead and then 7-2 before Audrey Heiser smashed one home for the Trojans to make it 7-3. Heiser did that a couple more times over the next few points and then Camille Pohl got a kill also to get Arcanum within 9-6. 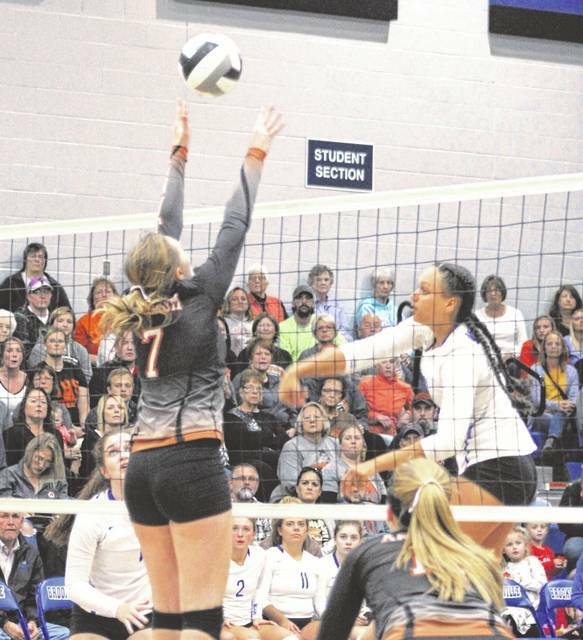 Arcanum was eventually able to tie the set at 16-16 after another kill by Heiser that had the Trojans pumped up. Miami East ran off the next few points to go up 19-16, but then back-to-back kills by Pohl and Heiser tied it up 19-19. The match went one point for the Vikings and then one for the Trojans the rest of the way until it was 24-24 and then Miami East got two in a row for the 26-24 win. 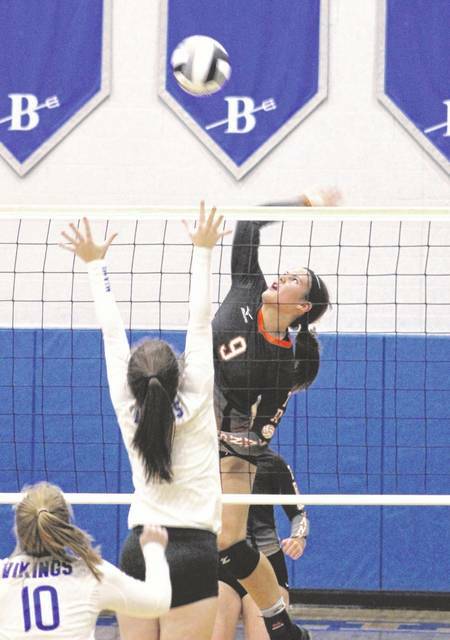 The third set saw Arcanum get its first lead of the match at 3-2, but it didn’t last long as Miami East ran off four straight points to take a 5-4 lead. The Trojans got one more lead in the match at 9-8, but the Vikings tied it 9-9 and then took the lead for good at 16-15. “We had way too many errors tonight,” Arcanum coach Macey O’Dell said. “We just had a lot of errors that shouldn’t have been there. Miami East is an amazing team, but I think we are just as good and we just didn’t show that tonight. The Trojans end their season with a 21-5 record. It is their fifth winning season in a row and the 21 wins is the most wins in a single season in team history. Arcanum will have many of its starters returning next year, but they do lose three seniors – Jenna Haney, Macey Hartman and Sadie Sink. The Daily Advocate sports editor Skip Weaver can be reached at (937) 569-4316 or by email at sweaver@aimmediamidwest.com. You can also follow him on Twitter at @skipweavder65.